Mirror finish on stainless steel etc. 4 easy steps to achieve a mirror finish on stainless steel, copper, brass etc. from your 115mm angle grinder. Apply blue polishing compound & again use the Gloss polishing disc to achieve your mirror like finish! 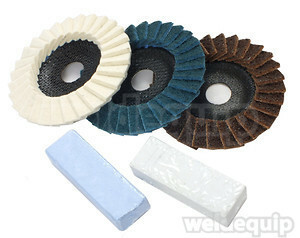 For aluminium polishing use the optional Brown polishing compound block. For optimum results use a different Gloss polishing disc for each colour compound block. 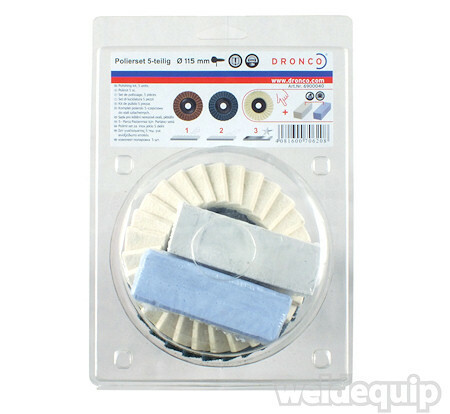 Blister packed, standard fitting for all 115mm angle grinders.